In an earlier post, we looked at the different types of water that a car wash operation might use, and how your choice of detergent is affected by them. 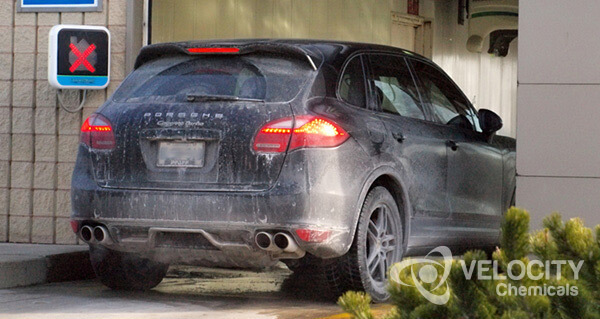 But that article didn’t take into account the car wash system being utilized – like in-bay automatic car washes. 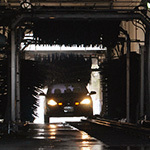 The in-bay automatic car wash is one of the most popular types around. But with it, some unique issues arise. Not least amongst them is which chemical cleaning detergent offers the best results, and what settings work best. As you know, the in-bay automatic car wash runs back and forth over a stationary car, unlike the tunnel car wash which uses a conveyor belt to move the car. Because of the two-step car washing process, the machine itself works hard, so the type of detergent used can play a part in lengthening its life. In some quarters, the two-step car wash is seen as inefficient, with either too much water or too much detergent used. But there are some clear advantages, especially in touchless in-bay automatic car washes. Whether the car wash system is friction-based or touchless-based has a say too. The difference might seem simply mechanical, but they do influence which chemical make-up works best. In fact, the key difference is obvious when you consider that friction can physically pull dirt and grime off the vehicle surface, whereas the touchless system relies solely on chemistry to lift and remove. High-quality detergents must be applied in the correct way to guarantee the best wash results. So, while the brand is important, the detergent can neither be too strong nor too weak if customers are to be satisfied. Ideally, it is best to use soft water rather than hard water. This means removing the mineral salts and replacing them with sodium salts to create a grain-per-gallon (gpg) rate of less than 3.5. The water also needs to be applied in high pressure jets, so the power rinse setting is the best choice. Soft water helps to minimize the build-up of scale, which is good for maintaining nozzle pressure. It is recommended that an alkaline presoak be used. The reason is that it offers a certain amount of lubricity which helps to protect friction components. The hard surface cleaning surfactants also mean that the vehicle is cleaned to a high standard. It is recommended that the presoak be a lesser strength alkaline than with the touchless system. This is because the friction lends that extra strength, so the chemistry need not be. A mildly acid or low pH second soap pass will help in the drying process. At Velocity Chemicals, we’ve been perfecting products for professional and commercial vehicle wash facilities for years, always placing quality first amongst our priorities. Our range of truck, large vehicle and car wash detergents are effective and cost-efficient, offering comprehensive solutions to Clean Better by delivering high-quality chemicals and solutions throughout North America. CAR CARE – a very high-foaming liquid car wash that removes road film, dirt, dust, and light oils and grease from the exterior of vehicles. It’s ideal in automatic car washes though is also suitable for brush or power washers, and has a pH of between 8 and 10. It’s already popular amongst car dealerships, rental car agencies and wherever cars or bus exterior are cleaned. COMMANDO VEHICLE WASH – a highly concentrated, high-foaming detergent that is ideally suited for brushless pre-spray and wand wash cleaning and degreasing. Removes road film and light oil or grease from vehicles in truck and car washes, but is also highly effective in heavy equipment shops, railroads and mines. RODEO-NP – a high-foaming, non-caustic detergent which uses no phosphates that is ideal for general purpose vehicle cleaning and degreasing. Removes road film and light oil or grease from vehicles in truck and car washes, but is also highly effective in heavy equipment shops, railroads and mines. Has a pH of 10.5 to 11.5. TRANSPORT – a high-foaming, non-caustic detergent for general purpose vehicle cleaning and degreasing. Removes road film and light oil or grease from vehicles in truck and car washes, but is also highly effective in heavy equipment shops, railroads and mines. Has a pH of 11 to 13. Other products in the Velocity chemicals range include ABF and MOBIUS (both heavy-duty aluminum brighteners that can be used to remove road film, rust, oxides, light oils and greases), ETCH FREE II (an acid based cleaner for use on acid resistant surfaces). Velocity Chemicals products are also environmentally-friendly manufacturing processes. We carefully select raw materials, use less waste water and support chemical and container recycling. So, for Cleaner, Brighter and Better Cars, Velocity Chemicals is the right choice as your car wash chemicals provider.